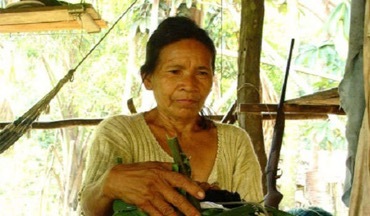 Rosa Andrade, 67 years old, was the last woman to be able to speak an ancient indigenous language known as Resingaro. She belonged to the Peruvian tribe of Ocaina, but her mother was a Resingaro, so Rosa and her brother were the only two people able to speak their mother native language. But now her language is destined to disappear; Rosa was brutally killed in December 2016 in unclear circumstances. Her body was found decapitated at her home in the Amazon rainforest. Now her brother Pablo is the only person on Earth speaking Resingaro, which is now destined to disappear together with its legends, stories, and traditions. Unfortunately, Rosa’s story is not an isolated one; it is counted that every two weeks an indigenous language becomes extinct. The very own Ocaina language is spoken just by 40 people all around the world. Of the 62 endangered languages spoken in Peru the majority are critically or severally endangered, which means that only the older members of the tribes speak these languages, and it is spoken partially or infrequently just in specific social context. Most of those languages have disappeared progressively, due to the diffusion of a national language spoken in schools, television, or by institutions. Sometimes they are simply outclassed by a predominant indigenous language, but often more frequently these languages disappear instantly with the death of their last speaker, as the indigenous groups living in Amazonia have been decimated by diseases and by companies who have exploited their soils. As an example, both tribes of Ocaina and Resingaro have been decimated by exploitation and diseases during the intensive Peruvian rubber boom of the XIX century, and most of indigenous groups have seen their habitat severally endangered by growing industrialisation. Saving indigenous languages is the principal alternative for saving a culture which is destined to disappear. In an attempt of promote their language’s conservation, some indigenous groups have chosen not to share their knowledge with the rest of the world; this is the example of the Kallawaya tribe, who commonly use Spanish and Quechuan in everyday life, but speak a secret language during their ritual and medical practices. Other groups have seen modern technology and institutions as a way for preserving their mother tongue. Nowadays several research groups are trying to save thousands of tribal languages which are on their way to disappear by recording and transcribing them. The Resingaro language was transcribed in several textbook by old missionaries in XIX century. Before dying, Rosa Andrade herself had been nominated by the Peruvian Institution to teach Resingaro in schools and to youngest generations, but now she is no longer here, the only hope seems to be old textbook and her brother, the only witness on Earth of a language and a culture that risk being lost forever.